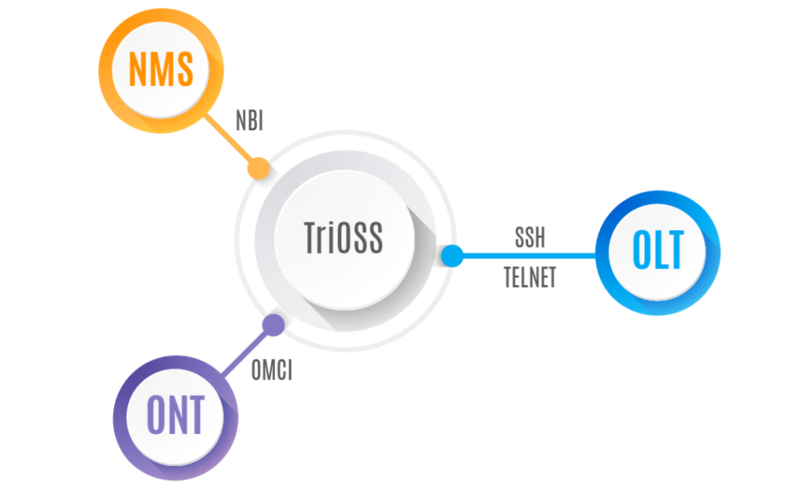 TriOSS is a GPON layer automation solution to perform user’s creation and service provisioning instantly, in FTTH networks. TriOSS saves operational costs in terms of technical man-hours, increases efficiency and drastically reduces provisioning and fault identiﬁcation time, thus improving quality of service and customer experience. The advanced module performs live operations on ONT to give status against each provisioned service. This enables the operator to verify and carry out troubleshooting in case of service failure. In addition, operator will be able to monitor traffic rate against the service, thus giving the option to charge customers on the basis of utilized data. MAC address limitation will be enforced to ensure authorized connectivity of customer devices with the CPE. Third party Network Monitoring System for operations and maintenance of PON network can be integrated with TriOSS. Complete set of singular and multiple ONTs and its subsequent physical parameters are monitored on third party NMS. PON port alarms are triggered in case fiber health benchmarks are not being met. This results in quick escalation to concerned field teams for resolution of issue and ensuring maximum up time of customer services. TriOSS acts as a black box that connects with the NMS (Network Management System) to perform its functions on both OLT (Optical Line Terminal) and ONT (Optical Network Terminal). The OLTs are accessed via telnet or SSH whereas NMS connectivity is established using north bound interface (NBI) by XML, TL1 and SNMP language. Monitoring and alert management is done over SNMP and syslog; sent to a third party server. Automated ONT configuration and service provisioning is available in real time as well as one-click configuration method. There are multiple options for Customer data management pertaining to a billing mechanism. You can choose from day-wise or time-dependent crones for implementation of all related functionalities. FTTH network monitoring and fault identification is handled by alerts configuration on a third party monitoring system. OLT sends data to this system where a range of alerts can be set by Nayatel as per requirement of the client. The basic module of Automation solution creates ONTs in the network via NMS. ONTs will be provided with unique identification parameters for data management. Pre-defined VAS profiles are pushed in the ONT for service configuration purposes. The installed automated ONTs have an option to run various degrees of service as per requirement of the client and give categorized service provisioning solutions. The solutions include provisioning of internet over a PPPoE server, Public IP routed configurations, Voice solutions and Point to Point services. Auto IP assignment facility is provided for remote accessibility of terminal nodes. Clients can also incorporate their trademark service with TriOSS. TriOSS automation solution has developed the back-end technology to use RF and POTS port of the CPE depending on its availability in the model of the ONT. Operator can provide cable and voice services to its customers with TriOSS. Moreover, RF port provisioning, optical parameters and locking/unlocking can be done on both NBI and CLI. Telephony services are provisioned by configuration at OLT and ONT end. ONTs are provided with auto-IPs which are registered with client’s voice solution. Operator can remotely lock or unlock the POTS services from the ONT to ensure billing. IPTV services provisioning can be done if client has the requisite video equipment at its headend. The configurations are done on OLT on the basis of Multicast VLAN and IGMP channels. Customers become part of the multicast group to view live channels. Service provisioning and IGMP configurations are pushed in the ONT via VAS, which communicates with OLT. TriOSS also enables you to to store and analyze TV channel viewership of its customers via online portal. This enables the client to gather real time TV Channel viewership and provide TV channel rating services. © Copyright 2019 Nayatel | Designed & Developed by Nayatel Creatives.